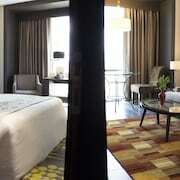 Walking distance to MOA and close to the Airport .Check In and Out were fast.Bed and pillows were comfortable. Where to find Pasay hotels near an airport? How can I find hotels in different Pasay neighborhoods? Where can I find hotels in Pasay that are near tourist attractions? 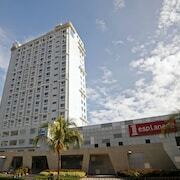 Short- and long-stay accommodation choices are in generous supply in Pasay. Expedia's extensive database has 320 hotel options that are within a 0.1-kilometre (0.06-mile) radius of Pasay's downtown. Pasay offers a selection of handy accommodations, such as the Midas Hotel & Casino and Heritage Hotel - Manila. The Pasay area offers a solid selection of lower-priced accommodation options that will be sure to satisfy even the thriftiest vacationers and travelers. 0.6 kilometres (0.3 miles) from Pasay's heart is the The Mabuhay Manor. The Networld Hotel Spa and Casino is just 2 kilometres (2 miles) away. 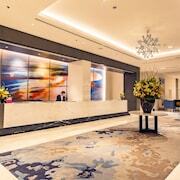 Other options in the lower price range are the Atrium Hotel and the Victoria Court Gil Puyat. You could try the Raffles Makati or the Makati Shangri-la Hotel, Manila. 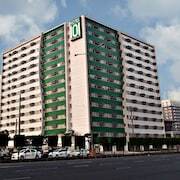 The Raffles Makati can be found 3 kilometres (2 miles) away from downtown Pasay. The Makati Shangri-la Hotel, Manila, is located 4 kilometres (2 miles) away. Other alternatives in this area are the Maxims Tower and the Vivere Hotel. Once you have thoroughly explored Pasay, why don't you go a bit more of the region? The Luzon district has plenty of scenic and cultural delights waiting to be explored. Luzon is known for rural landscapes and beaches. Popular Luzon tourist destinations include traditional villages, old towns and war relics and monuments. In this part of Philippines visitors can also try their hand at rock climbing. Makati is 4 kilometres (2 miles) to the northeast of Pasay and is home to the Ayala Center and Alliance Francaise. Expedia-listed Makati accommodation options include the Ascott Makati and The Peninsula Manila. Alternatively, you could consider staying at Alabang, 14 kilometres (9 miles) to the south of Pasay, where you can choose from the The Bellevue Manila and Parque Espana Residence Hotel. The Baliton Beach and LazerXtreme are a couple of the more popular places to experience when visiting Alabang. If enjoying sport is what you love, be sure to visit Smart Araneta Coliseum, which is 11 kilometres (7 miles) to the northeast of Pasay. Sleep nearby to the action at the Edsa Shangri-La, Manila or the Oakwood Premier Joy-Nostalg Center Manila. 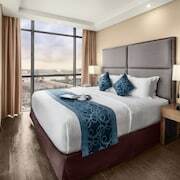 For travelers planning on arriving through Ninoy Aquino International Airport, you can book a bed at Manila Marriott Hotel, or Fairmont Makati, Manila, both of which are nearby. What are the most popular Pasay hotels? Are there hotels in other cities near Pasay? What other types of accommodations are available in Pasay? Explore Pasay with Expedia.ca’s Travel Guides to find the best flights, cars, holiday packages and more!